ABSTRACT: In this article, teacher and student discuss the use of visual and sensory mediums to normalize communication with a very troubled child in a special school setting. They describe their efforts to see his confusion through his eyes and to feel the fear and frustration he experienced. Finally, they present the design of their plan of action, which resulted in smiles and feelings of accomplishment and hope for everyone. We first discussed Stewart in an academic setting, far away from the special education program where he was terrorizing students and teachers with acts of aggression. The school he attends is a special program for the physically disabled. He is enrolled in the primary class, which is made up of ten students, male and female, ranging in ages from six to nine, and has been a student at this school for three years. Our class discussion about him started from the assumption that the label “aggressive” was somehow inaccurate; this evolved into a new helping strategy. The narrative which follows describes the observations and theoretical considerations involved in the formulation of a plan of action using visual mediums, as well as the process of implementation and outcome. Stewart is a seven year old physically disabled child. He is three feet, six inches tall, with curly brown hair and big brown eyes. He is small for his age, except for his stomach which jiggles when he runs and jumps. At birth, he was diagnosed as having multiple congenital deformities. The area of his body that is most severely affected is his face, especially his mouth. He cannot voluntarily move his lips, tongue, or jaw. He is a non-verbal child and is hearing impaired. He is able to vocalize some sounds but, because of his facial deformities, he is unable to speak. However, everyone is aware when he is nearby because the sounds that he does make are always loud and high pitched. The extent of his hearing impairment is not yet known, and he is currently being assessed and tested for a hearing aid. At the moment, he responds to people only when he sees that they are speaking directly to him. When he has a need to communicate, he approaches people, running up very close to them and blocking their way so that they can see that he has something on his mind. For Stewart, effective communication is a difficult task. Presently, he uses American Sign Language as well as gestures which he has created. At times, he combines the two sets of symbols, making it difficult for him to be clearly understood. Despite the difficulties he encounters in communicating, he is an extremely inquisitive child, forever asking questions. No matter what the response, there are always more questions to follow. He is interested in knowing what is going on around him at all times; he is just as interested in events that concern others as he is in those which directly affect him. Often his interest in others evolves into concern. If a student is absent or missing from class, he has to know where he or she is, whether or not they are sick or hurt and when they will return. Of special concern to the child care team were Stewart’s aggressive behaviors; while in school he often kicked others. His response after kicking was always the same: he did not run away and hide, or deny having done it. He openly admitted to the kicking and always signed the word “sorry” to his victim. For Stewart, this aggressive behavior occurred so frequently that signing the word “sorry” had become an automatic response. He was so conditioned to respond in this manner that he frequently kicked and apologized simultaneously. The first step in our planning process was to make more precise and detailed observations of Stewart within the school setting, in order to gain more insight into his aggressive behavior. The first important fact we were able to focus on was that Stewart kicked most often at particular times during the school day, especially during times of transition. The frequency of aggressive behavior was greatest at the end of a class period when Stewart was required to leave one classroom to go to another for another subject. The “trigger” for kicking appeared to be any change in environment. The victim was most often an innocent bystander, male or female, child or adult anyone within close proximity of him at the time of transition. Further investigation revealed that the changing of classroom environments within the school setting is a new experience for Stewart. During the two previous years, he had the same teacher and remained in the same classroom for the entire day. He now has different teachers and no longer remains in the same classroom for more than two periods at a time. Whereas Stewart’s previous school environment remained relatively stable throughout the day, it now changes on an average of every two hours, and sometimes even more frequently. Following this discovery, we focused our observation on Stewart’s behavior whenever a change in classroom setting was required. When the bell rang to signify the end of a class period, he would sit or stand in a still position while other students hurried off to their next class. Depending on the day of the week and the subject, some students would leave the room and others come into it. While all this movement occurred around him, Stewart remained motionless. After a few minutes, he would seek out an adult and sign a series of questions in a somewhat frantic manner. Should he stay or should he go? If he has to leave, where is he going? Where is everyone else going? Why does he have to go? Why can he not stay in this class all day? Stewart repeated each of these questions several times during the course of every school day. Most often the adult being questioned responded to him verbally, giving no explanation other than telling him where he should be. It was at this time that he would act out aggressively and kick someone. At this point, we paused to clarify our picture of Stewart’s relationships with teachers and staff. Our image was of a small boy reaching out from behind a wall twice his size in a frantic effort to understand and be understood, to somehow be like other youth in the program. We saw him as trying desperately to please his teachers and make them happy, but completely frustrated in his efforts to accomplish this basic objective. We began to have a sense of how trapped he must feel. As we explored this image further, his tension and anger became very real for us, and we began our search for possible helping strategies to find a way to break through. As part of his school schedule, Stewart regularly participates in field trips. Organized by the school, these outings take place once a week for two hours in the afternoon. A group of eight children from grades one, two, and three participate. The purpose of these outings is for the children to see and experience the community outside the school environment. Of special significance was the fact that Stewart did not exhibit any aggressive behaviors during these field trips. The single most important difference seemed to be the quality and quantity of preparation students receive prior to taking part in the outings. Each morning on the day of a trip all of the group members sit down together to discuss where they will be going that afternoon. A great deal of time and effort is put into this explanation. When communicating with the group, the adults use verbal language, sign language, and pictures to represent all aspects of their destination for that day. In addition, they explain when they are going, how they will get there, how they will return, and what they will do upon their return to school. The clarity of this explanation became an important clue to our understanding of how to help Stewart be less aggressive at other times in the school day. Our primary consideration was to move from symptom description to consideration of the cognitive abilities of a child Stewart’s age. Without this understanding, we would be forced to focus solely on external environmental conditions and contingencies to alter Stewart’s behavior. Our goal, however, was to help Stewart learn to reorganize his perception of his immediate environment, not to unnecessarily remove the possibility of his growth by simplifying the demands of his school program so he could cope more successfully. Recognizing that a child's world is primarily one of visual-spatial relations and patterns, as well as environmental sounds and rhythms (Ley,1979; Gardner,1985), and without re-tracing all of our theoretical steps, we began to see that what looked like aggression to an adult observer, may be extreme sensory and kinetic arousal in a completely disoriented child. This arousal is associated with exaggerated activation of the right brain hemisphere (Ley,1979; Kinsbourne, 1988) and results from his being unable to represent internally the sequence of movements he should pursue in his immediate environment (Gardner, 1982, 1985). Stewart, we hypothesized, was not being “aggressive” but was expressing extreme fear and frustration in a manner appropriate to the developmental level of a seven year old child. He could see others moving and did not know where to go or how to “communicate” his confusion. Unbalanced in this way, he experienced a “runaway in the limbic system” (Hampden-Turner, 1981), with no way to control the resulting flow of kinetic energy racing through his body and limbs. The final piece in testing our hypothesis involved finding a representational form in which Stewart could communicate with staff and through which he could learn the sequence of movements he was expected to follow. We chose to focus on “visual-tactile intelligence” (Gazzaniza, 1985; Gardner, 1985) in which learning occurs through visual and tactile associations and by the manipulation of objects and visual symbols, without dependence on abstract language and concepts which were clearly beyond Stewart’s grasp. Pictures in sequence would be the external means through which Stewart could internally learn to gain control over his actions and emotional responses (Gardner, 1982). Our basic plan was to create a “map” for Stewart in the form of a visual daily schedule, which would represent the flow of his school day. He would be able to have it in his possession at all times and could refer to it in times of need. It would incorporate multiple mediums “pictures, numbers, and words “to create the opportunity for learning by making new associations, as well as assisting him to comprehend fully and to communicate clearly and effectively. The final design, shown in Figure 1, had the five days of the week across the top of the page so that each school day appeared in one of five columns. 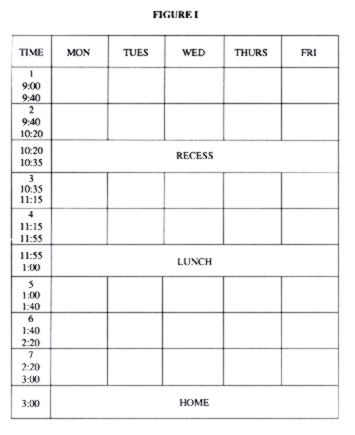 Since Stewart had already memorized the days of the week, he would be able to find them on the schedule as required. Each column had seven “blocks” to represent the total number of class periods in each day, as well as spaces with pictures to represent recess, lunch, and the bus ride home. Because Stewart knows numbers but does not understand the concept of time, class times were shown with a number from 1 to 7 to assist him to see the sequence of events in each day. All of the symbols used to represent the different class periods displayed on the schedule were ones he had seen and used previously. 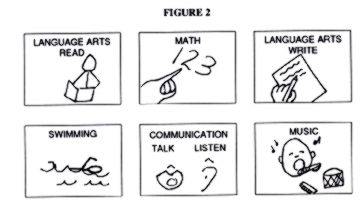 The examples in Figure 2 represent his reading, writing, math, swimming, music, and communication classes. Only the various numbers have been omitted. The final product was sealed in plastic so he could cling to it, hold onto it tightly, or even spill his lunch on it without doing any significant damage. Its physical survival was as secure and predictable as we hoped he would feel about the school day it represented. Finally, daily briefing sessions were held with Stewart to review the sequence of changes he would experience that day, and to be sure he could see and understand each of the transition times on his schedule. Short role playing sessions were used to model and practice how he could use the schedule to ask for assistance if he needed it. When Stewart was first shown the daily schedule, he became excited. He got up out of his seat, ran across the classroom, and stopped directly in front of a mirror that was hanging on the wall. He waited for a few seconds until he got everyone’s attention, then he faced the mirror, placed his two index fingers in his mouth and pulled them back causing his lips to spread. He was smiling, something he had never done before. Even his facial deformities presented no serious obstacle to the expression of pleasure he was feeling. Immediately following the smile, Stewart left the mirror and ran around the classroom from one desk to the next showing everyone in the room his schedule. He did not miss a single person. After a few minutes had passed and everyone had seen the schedule, Stewart asked if he could take it home. In fact, he not only asked, but insisted on taking it home, and ran over to a hook on the wall where his school bag was hanging. Standing there with his school bag partially open, he repeated over again how desperately he wanted to take it home. Stewart was told that it was necessary to kept the schedule in school but that he could have a copy of it to take home and leave there. He agreed and seemed content with this solution. Of special significance are two changes which occurred over the next few days and weeks. The kicking behavior stopped immediately and completely, and Stewart appeared far more relaxed and at ease with himself and other people. Oriented and secure in his immediate environment, the kinetic arousal and tension diminished to the point where he could move beyond his current crisis and have the chance to develop more normally, both cognitively and socially. Stewart still has many problems to deal with. Of special importance is his invasion of other people’s personal space by touching, poking, tickling, and playing with their hair. The prognosis, however, is good as the change in Stewart’s aggressive behavior has brought about a change in staff perceptions, leading to more creative therapeutic ideas and efforts. Staff are talking about using visual schedules with other students, extending the use of visual mediums with Stewart to help him adjust in other even more normal settings, and creating a totally safe world for Stewart by involving his family in using the strategies that have been effective at school. What had been a desperate situation is now seen as one with many hopeful possibilities. Gazzaniga, M.S. (1985). The social brain: Discovering the networks of the mind. New York: Basic Books. Hampden-Turner, C. (1981). Maps of the mind. New York: MacMillan Publishing. Kinsbourne, M. (1988). Hemisphere interactions in depression. In M. Kinsbourne (Ed.). Cerebral Hemisphere Function in Depression. Washington: American Psychiatric Press. Ley, R.G. (1979). Cerebral asymmetries, emotional experience and imagery: Implications for psychotherapy. In A. Sheikh and J. T. Shaffer (Eds.). The Potential of Fantasy and Imagination. New York: Brandon House. This feature: Toman, L. and Gray, B. (1991). One child's smile: Non-verbal approaches to cognitive therapy. Journal of Child and Youth Care, 5, 1. pp. 51-58.